This week’s theme includes home canning equipment, bathroom products, hair-styling accessories, and a small selection of kitchen items. Crofton 21.5-Qt. 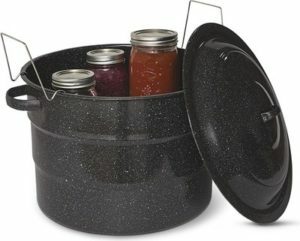 Canner With Rack, $17.99. It’s prime season for preserving tomatoes, peaches, and more from your garden or farmers market. If you’ve been wanting to learn how to can food using a water bath canner, Aldi can help you get started without spending a lot of money. Includes canner, jar rack, and lid. You also can purchase a Ball 12-Pack of Regular Mouth Pint Canning Jars for $7.99 or a Ball 12-Pack of Wide Mouth Quart Canning Jars for $9.99. In addition, you can buy a Crofton Canning Utensil Set for $4.99 that appears to include a funnel, jar lifter, jar wrench, and bubble remover. I recently purchased a Granite-Ware canning set that includes everything listed here except for jars, and I spent $40. I’ve never seen Aldi sell canning supplies before, or I might have waited for this deal. Crofton Herb Scissors or Herb Mill & Stripper, $4.99. Huntington Home 20″ x 34″ Memory Foam Bath Mat, $9.99. You also can purchase a Huntington Home 17″ x 24″ Memory Foam Bath Mat for $5.99. Read our review of one of Aldi’s bath mats at this link. SOHL Furniture Bathroom Wall Shelf, $12.99. Features Built-in towel bar and advertises easy assembly. SOHL Furniture 3-Shelf Bathroom Space Saver, $12.99. Adjustable feet keep shelf level. Available in satin nickel or bronze finish and measures 9.65″ x 23.03″ x 64.96″. Advertises easy assembly. SOHL Furniture Towel Tower, $12.99. Adjustable feet ensure product is level on any surface. Rust resistant. Each shelf holds up to 10 lbs. Hardware included. Advertises easy assembly. SOHL Furniture Shower Caddy with Tension Pole, $12.99. Adjustable to fit standard ceilings. Available in satin nickel or bronze finish and measures 10.35″ x 8.66″ x 57.08″ – 106.29″. Advertises easy assembly. Easy Home Toilet Tissue Roll Dispenser with Shelf, $7.99. Ideal for inside a cabinet or vanity. Holds up to 6 rolls of toilet paper and measures 5.375″ x 17.5″ x 12.75″. Dentiguard Power Toothbrush, $4.99. Read our reviews of Aldi’s power toothbrush at this link. You can read about other Aldi toothbrushes at this link and this link. Easy Home 2-Gallon Wastebasket, $3.49. Easy Home 5-Function or Rainfall Showerhead, $4.99. Easy to install with anti-clog nozzles. Visage Hair Straightening Brush, $14.99. Features temperature control and LCD display. Visage Hair Brushes, $2.49. Choose from a Paddle Brush, Detangle Brush, Vent Brush, or Round Brush. Visage Flat Iron, Curling Wand, or Curling Iron, $14.99. Visage 21-Piece Number Cut Haircut Kit, $12.99. SimplyNature Organic Grass Fed Ribeye Steaks, $9.99 per lb. USDA Organic. Jennie-O 90/10 Ground Turkey, $6.99 for 3 lbs. Butterflied Lamb Leg, $5.99 per lb. Choose between Rosemary or Unseasoned. Ball, Crofton, Dentiguard, Easy Home, Huntington Home, Jennie-O, Simply Nature, SOHL Furniture, Visage. Bookmark. Is Monsanto Weed Killer in Aldi or Trader Joe’s Cereals?